Littbus is our innovative, complete shelving system designed by Börge Lindau of Sweden. We’re committed to ensuring that it is the strongest, most functional, most environmentally friendly system in today’s market. Only Littbus provides you with all of the benefits detailed below. At Lustrum, we continually develop our unique library furniture to meet the demands of ever-changing library environments. Choose shelving in materials and sizes that suit your needs from 84 standard combinations. This includes 10 standard unit sizes (four heights, three depths and three widths). Connect these units however best fits your space; for example, you can connect single to double-sided units and shallow to deep shelves. Select your finish, as well as any decorative panels and colour, from a range of options that includes powder-coated steel, wood (solid birch as standard) and glass. 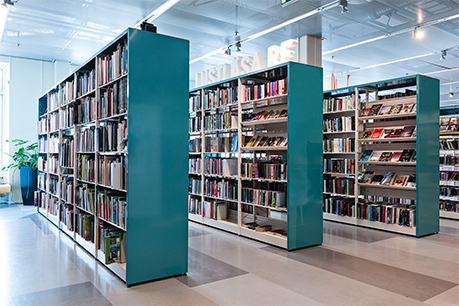 The structure – single or double-sided end panels in steel or solid wood connected by a unique steel shelf – is self-supporting. Because it does not require frames or cross-brace supports, you save around 6 percent of valuable floor space. Shelf planes are made from 1.5 mm thick steel (16 gauge) which is then powder coated, and steel adjustor feet protect and stabilise the shelves. You can adjust the height of individual shelves in 64 mm steps (optional 32 mm). If you wish to create a mobile unit, you can fix castors to a frame. 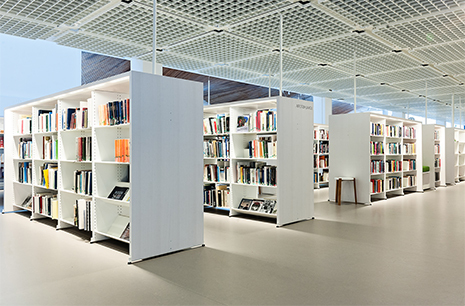 Littbus is one of the very few library shelving systems that are approved for the Japanese market due to its stability and strength for this earthquake environment. Littbus meets the European Union standards for libraries SS-EN 14073-3 EN1727:1989, ISO 7170:2005 and ISO 7171:1988, which include tests for strength, durability and stability, and British Standards test certification BS 4875-7:2006 Level 4 for strength and stability.